The next occupant of the Oval Office will need to transform campaign promises and a long list of priorities into real policies and programs that produce positive outcomes for the American people. During the past year, the Partnership for Public Service and the IBM Center for The Business of Government joined together in sponsoring a series of day-long discussions to inform the next president and the new administration about critical management issues and actions that can strengthen government’s capacity to address the challenges facing our country. Participants included current and former political and career leaders from the executive and legislative branches, subject-matter experts from the public and private sectors, and representatives from good-government organizations and the academic community. Each of the discussions focused on a key theme: Leadership Talent, Enterprise Government, Driving Innovation, Enhanced Decision-Making and Getting Things Done. Through these discussions, accompanying reports and related research, we have developed a management roadmap for the next administration. 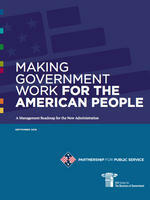 We hope this report will help the new administration successfully transition to power and improve the federal government’s performance throughout the next president’s term. Watch the video of the report launch event. Read an article about this report in Federal Computer Week. Read an article about this report in Bloomberg Government. Read an article about this report on Federal News Radio.